Natural teeth whitening is a subject that comes up frequently in my dental office. Some patients just prefer to avoid the normal whitening processes and chemicals, and are looking for a "home remedy". I only wish that tooth whitening was that easy! I have to tell you that none of the natural teeth whitening methods that I have seen on the internet will work. Some of them could even damage your teeth! I'm afraid that those pages often look like the advice was written by someone with very little dental knowledge - OR NO DENTAL KNOWLEDGE AT ALL. BUT THERE IS A WAY. . . . THERE IS A WAY to bring about a gradual brightening of your teeth over a period of time. I can tell you one thing about natural teeth whitening - it is a gradual process, taking some months! Definitely not for those in a rush. Also, your teeth will not get quite as white as they could do with conventional teeth whitening methods. However, if you have had some conventional teeth whitening done already, then this is an excellent way of maintaining the results you got, or even getting a little more brightness! Natural teeth whitening has two parts - first the stain removal, and then gradual whitening. Stain removal; If you have a lot of staining, you will need to see your dentist or hygienist for a good clean and polish. After that, you must prevent stain build-up by avoiding red wine, black tea and coffee, and smoking. You can slowly shift small residual staining with a high-quality toothbrush (providing you brush for long enough - 5 to 6 minutes!). I STRONGLY recommend the Cybersonic 3 sonic toothbrush - Read MY review of this toothbrush HERE - and get your special DISCOUNT CODE to get a HALF PRICE DEAL! This brush is definitely one to get. Gradual whitening comes from daily use of a toothpaste called BlanX White Shock whitening toothpaste, available from Amazon. BlanX White Shock whitening toothpaste has an extract from Arctic Lichen that has been shown to produce a whitening effect on tooth enamel. It also has a low abrasive index; this means it will not damage your teeth. AND it contains fluoride, so it helps to strengthen your tooth enamel against decay. There are several products in the BlanX range of toothpastes, but I think the only one you need is the White Shock Toothpaste to be quite honest. If you see a dental hygienist for a proper scale and polish, then the whitening effect of the BlanX White Shock toothpaste will work best! First, you must brush slowly for 5 to 6 minutes. This is VERY important. This allows enough time for the toothpaste to get into the enamel and produce a gradual whitening effect. It also allows enough time for the brush and toothpaste to remove any surface stain that may start to re-form. Second, you should do this at least twice a day. If you can brush for 5 - 6 minutes more often, say 3 to 4 times a day, then you will speed up the process. IN ADDITION, you will also be improving your gums! Over the course of 3 to 6 months, you WILL notice a gradual lightening in the color of your teeth. You should keep up the process, and your teeth will SLOWLY continue to lighten. But don't expect to get movie-star white teeth, even after 12 months. It's important to appreciate that this is a slow, gradual, subtle process. As a bonus, BlanX is also the only toothpaste to have been approved by the World Health Organization! (at the time of writing). It is an excellent all-round toothpaste, even if you are not too bothered about whitening your teeth. Natural teeth whitening definitely works, but you need patience and persistence. Be prepared for weeks and even months to pass before you start to notice much change! 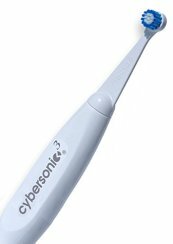 REMEMBER, if you're looking for a new toothbrush, I strongly recommend the Cybersonic 3 . Read my review of this brush HERE and to get your special half price discount code.